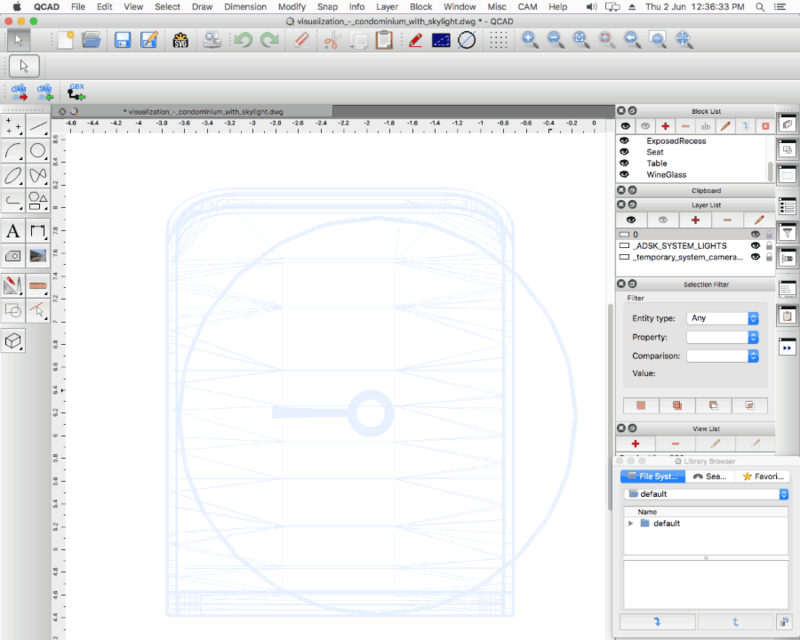 Here is a list of best free DWG viewer for MAC. You can easily use these freeware to view DWG files on MAC. DWG is a propriety format, thus there are quite a few options to help you view DWG files. DWG files are mainly used by architects, engineers, and others to design several elements. Sometimes it becomes quite necessary to view DWG files. In such times these freeware turn out to be life saviors. Some of these freeware provide you the option to edit DWG files on MAC, hide certain items, lock items, create 3D models, view it in different planes, etc. You can also choose the option to export DWG into other formats and take a printout of DWG files. Go through this carefully compiled list of best free DWG viewer software for MAC and get to know how to open DWG files on MAC using them. Out of these list of software to view DWG, I like SketchUp the most. It is due to the fact that, here you can easily choose the option to view and edit DWG files. Several simple editing options are available to make any desired changes to DWG files. The best part of this freeware is that you can convert DWG files to 3D objects and play around with them. You can also check out list of Best Free DWG Viewer Software for Windows, Free CAD Viewer Software, and MAC CDR Editor. SketchUp Make is an amazingly easy freeware to help you make several types of 2D and 3D diagrams. For the first time users, it turns out to be quite a funny and interesting tool to play around with its different features. The best option is that you are allowed to convert drawings into 3D. It can also be used to view DWG files for free. Though it doesn’t provides the option to directly open DWG file, you will have to Import DWG file into the software to view it. Option is provided to import SKP, DWG, DXF, 3DS, DAE, DEM, DDF, IFC, KMZ, BMP, JPEG, PNG, PSD, TIFF, TGA, and PDF files. Different viewing options are provided to help you easily and clearly view DWG files on MAC OS X. Some of the viewing options are: Move, rotate, scale, tape measure, pan, zoom, zoom extents, etc. Apart from these minor features to view DWG files on MAC, you are also provided with a number of features to edit DWG files on MAC. Some of them are: select tools, eraser tool, pen tools, arc tools, shape tools, push/pull, offset, move, move, rotate, scale, text tool, paint bucket, orbit, pan, zoom, and many more. Different camera, perspective, and view options help you view DWG file in different context. There are some other helpful options as well to help you edit using layers, outliners, scenes, solid tools, tape measure, protractor, axes, dimensions, 3D text, add shadows, fog, match photo, soften edges, etc. You can also add Geolocation through Google Earth. If required models can be downloaded and used, and you can also upload your model to the Warehouse. After making changes it can be chosen to be exported into 3D model as 3DS, DAE, FBX, IFC, KMZ, OBJ, DWG, DXF, WRL, and XSI format. It also supports option to be exported as 2D Graphic as JPEG, PNG, TIFF, PDF, EPS, DWG, and DXF. A pro version of SketchUp is also available providing you some extra features. QCAD is a simple freeware which can be used to open different types of CAD files for free on MAC. Apart from viewing DWG files on MAC it can also be used to view DXF, DWT, DXB, DGN, DWF, DXFLIB, SVG, GBX, and GBR files for free. There are a number of viewing options provided. Different block list, layer list, view list, property editor, selection filter, clipboard, library browser, etc. make your task quite easy and comfortable. 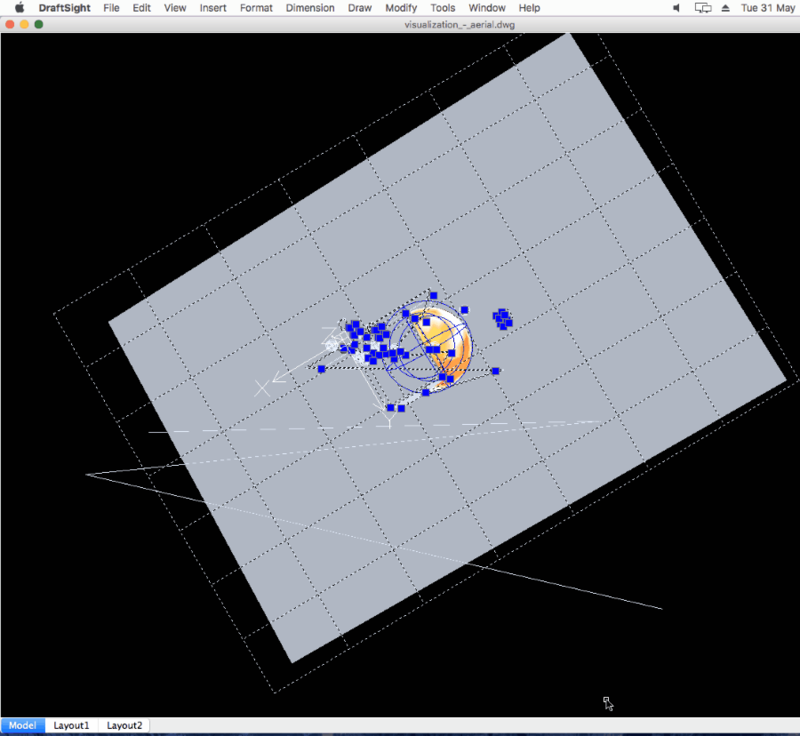 There are some other viewing options as well, like: draft mode, screen-based linetypes, anti-aliasing, grid, zoom, add view, remove view, edit view, pick view, isometric grid off, top projection, right projection, left projection, layer list, block list, view list, property editor, selection editor, library browser, and many more such options. Selection tools: Select, deselect, select view, invert selection, etc. Draw tools: It can be used to draw points, line, arc, circle, ellipse, spline, polyline, shape, ring, text, hatch, and insert bitmap. Dimension tools: Dimension options can be set to aligned, rotated, horizontal, vertical, ordinate, leader, radial, diametric, angular, etc. Modify tools: There are numerous modify options provided to choose from, like: move, copy, rotate, scale, mirror, flip, move and rotate, align reference points, offset, trim, lengthen, shorten, stretch, clip to rectangle, chamfer, bevel, round, divide, split entities, break out segment, break out manual, auto trim, break out gap, reverse, edit text, edit hatch, align, and many more such options. Layer tools: Different layer tools act as an icing on the cake by letting you toggle visibility, show only active, show all layers, hide all layers, lock all layers, unlock all layers, add layer, add sublayer, create layer from selection, delete layer, purge unused layer, edit layer, select layer, deselect layer, etc. Block tools: Block options are provided to toggle visibility, show all blocks, hide all blocks, add empty block, create block from selection, remove block, purge unused block, rename block, edit block, edit block from reference, select block from references, deselect block references, and return to main drawing. There are some other tools as well, like Snap tools Info tools, CAM tools, and other miscellaneous tools. Files can be saved as DXF and DWG. You can also export files as Bitmap, SVG, and PDF. Printouts of DWG files can also be taken through this freeware. 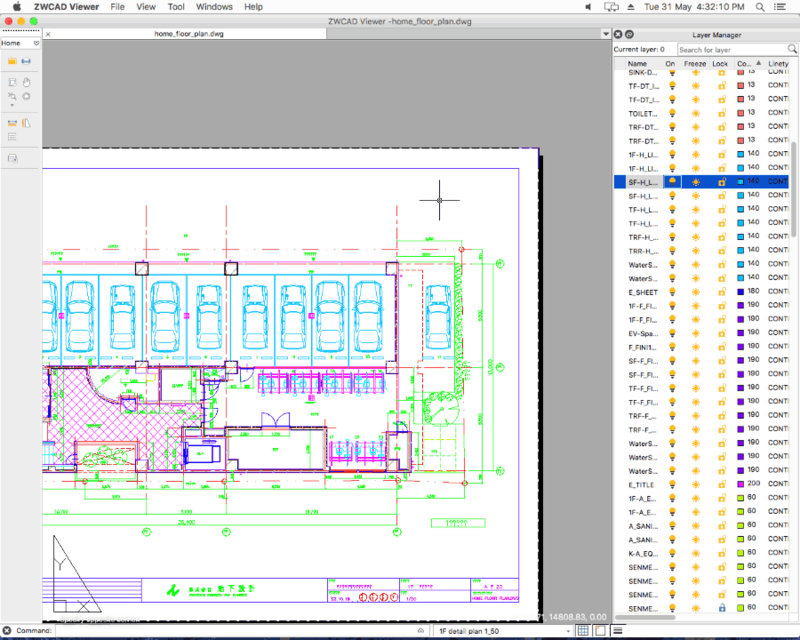 DraftSight is a good freeware for MAC to view and edit DWG files on. It can also be used to open DXF, DWS, and DWT files on MAC for free. Although it is free, it works without registration only for 30 days. In order to use it for longer period, you have to register then sign in to the software using your Email. Here you are provided with several tools to help you easily view DWG files for free. The options are provided to rebuild, refresh, constrained orbit, pan, zoom, named view, view tiles, hide, shade, animated rendering, display block attribute, and display CCS icon. Different layout viewing options are also provided. Editing Options: Cut, copy, paste, copy with reference point, paste as block, paste selected format, and erase. Layer Options: Option is provided to hide or show layer, freeze layer, thaw layer, lock layer, unlock layer, isolate layer, unisolate layer, activate layer, entity to active layer, change entity’s layer, etc. Insert options: Block, hyperlink, reference drawing, reference image, field, and rebuild fields. Formatting Options: Layer, layer tools, line color, line weight, dimension style, point style, print style, richline style, scale list, table style, text style, etc. Dimension options: Some of the basic dimension options are also provided, like: smart, aligned, linear, baseline, continue, ordinate, center-mark, diameter, radius, angular, arc length, jogged, leader, tolerance, align text, oblique, override, etc. Draw Options: You can also use this freeware to draw a number of elements in your DWG file, like: line, infinite line, richline, ray, 3D polyline, polyline, polygon, rectangle, sketch, arc, circle, ring, spline, ellipse, point, block, table, bound area, hatch/fill, region, mask, shape, cloud, text, mesh, etc. Modify Options: Some of the best modify options include the option to change properties, property painter, annotation scaling, clip, entity, component, pattern, delete, copy, offset, mirror, change length, move, rotate, scale, stretch, split, weld, chamfer, fillet, extend, trim, and explode. Some other important tools include: references manager, display order, inquiry, CSS manager, new CSS, Standards, Entity group, customize interface, and mouse gestures. DWG file can be saved as DWG, DXF, DWS, and DWT. You can also export DWG files as BMP, JPG, PNG, SLD, SVG, EPS, TIF, STL, PDF, etc. 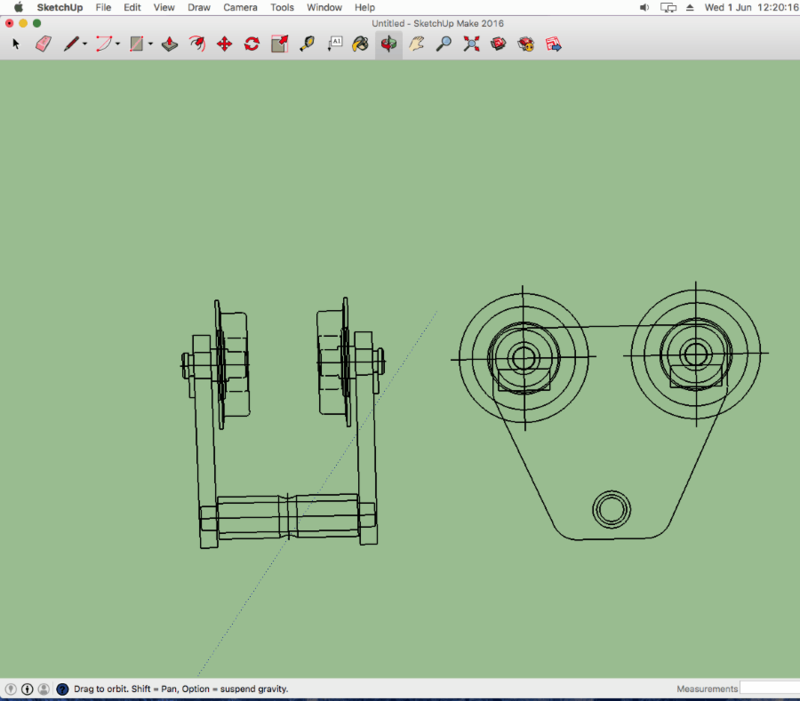 eDrawings Viewer by SolidWorks is a simple freeware to help you view DWG files on MAC for free. Here you can choose the option to properly view DWG files. If DWG files contain several sheets, you can have a close and detailed view of individual sheets too. Different zoom options are available to help you view details incorporated in DWG files, like: zoom to fit, zoom to area, and zoom in or zoom out. Rotate and Pan options are also provided so that you can view DWG file data in different interface, and views. There are some other tools as well, like: move tool, select tool, and play tools. If required, you can also change DWG file’s properties, like: appearance, paper color, etc. Some other effects that can be applied are: highlight color, override document background, use gradient background, use dynamic view animation, display shadows, display reflections, and automatically show manager. Different performance and stamps options can also be set. Different markup and comment options can also be set. DWG files can be exported in other formats, like EDRW, SGI, PSD, BMP, JPEG, PICT, PNG, MacPaint Image, TIFF, TGA, JP2, and QuickTime Image. You are also provided the option to try out the features of eDrawings Professional for 15 days. In order to do so, you have to enter the activation code provided on the website. This provides you the option to draw and edit CAD drawings. ZWCAD Viewer is a good freeware that can be used to view DWG files on MAC for free. Here you can choose to open DWG, DXF, DWF, and DWT files. There are different viewing options to help you clearly view DWG files. 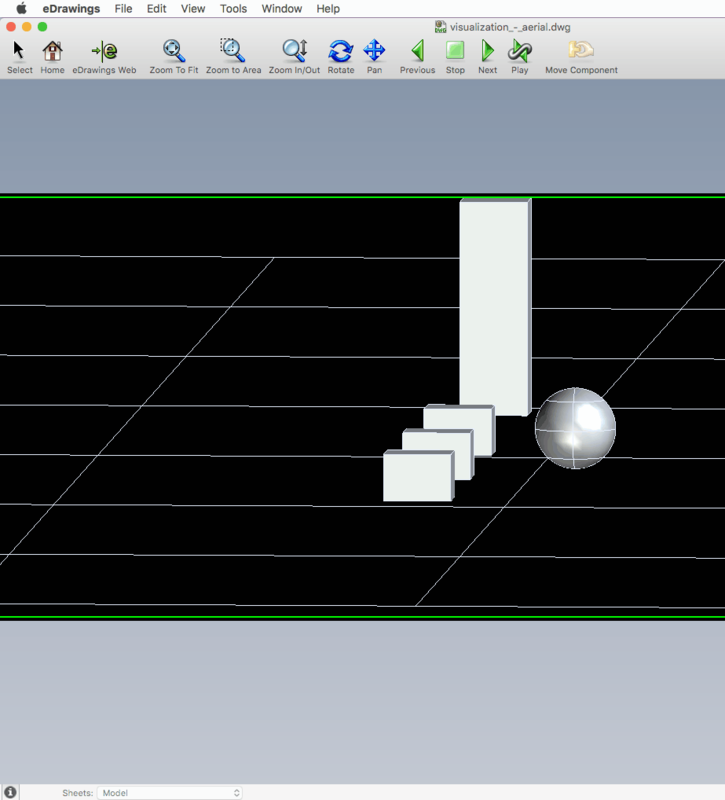 It helps you to view both 2D and 3D models on MAC. Some of the amazing viewing options are: pan, extents, zoom, orbit, window, previous, realtime, all, dynamic, scale, center, object, in and out. If the DWG file contains a number of pages, they can also be viewed separately. Distance and angle between two points can be found. Area and perimeter of 2D entities can also be calculated. The best part of this freeware is the layer manager, where you can view different elements that make up DWG file. Here you are displayed its name, color, linetype, lineweight, plot style, plot, new viewport freeze, and description. You can turn visibility of elements on or off, freeze or unfreeze the element, or lock or unlock the elements. Various other options can also be specified for grid display, object snap, and show or hide line weight. Some other options like: regen, recover, and audit can also be put to use.